Taxpayers fund the stadiums, antitrust law doesn’t apply to broadcast deals, the league enjoys nonprofit status, and Commissioner Roger Goodell makes $30 million a year. It’s time to stop the public giveaways to America’s richest sports league—and to the feudal lords who own its teams. Last year was a busy one for public giveaways to the National Football League. In Virginia, Republican Governor Bob McDonnell, who styles himself as a budget-slashing conservative crusader, took $4 million from taxpayers’ pockets and handed the money to the Washington Redskins, for the team to upgrade a workout facility. Hoping to avoid scrutiny, McDonnell approved the gift while the state legislature was out of session. The Redskins’ owner, Dan Snyder, has a net worth estimated by Forbes at $1 billion. But even billionaires like to receive expensive gifts. Taxpayers in Hamilton County, Ohio, which includes Cincinnati, were hit with a bill for $26 million in debt service for the stadiums where the NFL’s Bengals and Major League Baseball’s Reds play, plus another $7 million to cover the direct operating costs for the Bengals’ field. Pro-sports subsidies exceeded the $23.6 million that the county cut from health-and-human-services spending in the current two-year budget (and represent a sizable chunk of the $119 million cut from Hamilton County schools). Press materials distributed by the Bengals declare that the team gives back about $1 million annually to Ohio community groups. Sound generous? That’s about 4 percent of the public subsidy the Bengals receive annually from Ohio taxpayers. In Minnesota, the Vikings wanted a new stadium, and were vaguely threatening to decamp to another state if they didn’t get it. The Minnesota legislature, facing a $1.1 billion budget deficit, extracted $506 million from taxpayers as a gift to the team, covering roughly half the cost of the new facility. Some legislators argued that the Vikings should reveal their finances: privately held, the team is not required to disclose operating data, despite the public subsidies it receives. In the end, the Minnesota legislature folded, giving away public money without the Vikings’ disclosing information in return. The team’s principal owner, Zygmunt Wilf, had a 2011 net worth estimated at $322 million; with the new stadium deal, the Vikings’ value rose about $200 million, by Forbes’s estimate, further enriching Wilf and his family. They will make a token annual payment of $13 million to use the stadium, keeping the lion’s share of all NFL ticket, concession, parking, and, most important, television revenues. After approving the $506 million handout, Minnesota Governor Mark Dayton said, “I’m not one to defend the economics of professional sports … Any deal you make in that world doesn’t make sense from the way the rest of us look at it.” Even by the standards of political pandering, Dayton’s irresponsibility was breathtaking. In California, the City of Santa Clara broke ground on a $1.3 billion stadium for the 49ers. Officially, the deal includes $116 million in public funding, with private capital making up the rest. At least, that’s the way the deal was announced. A new government entity, the Santa Clara Stadium Authority, is borrowing $950 million, largely from a consortium led by Goldman Sachs, to provide the majority of the “private” financing. Who are the board members of the Santa Clara Stadium Authority? The members of the Santa Clara City Council. In effect, the city of Santa Clara is providing most of the “private” funding. Should something go wrong, taxpayers will likely take the hit. The 49ers will pay Santa Clara $24.5 million annually in rent for four decades, which makes the deal, from the team’s standpoint, a 40-year loan amortized at less than 1 percent interest. At the time of the agreement, 30-year Treasury bonds were selling for 3 percent, meaning the Santa Clara contract values the NFL as a better risk than the United States government. Although most of the capital for the new stadium is being underwritten by the public, most football revenue generated within the facility will be pocketed by Denise DeBartolo York, whose net worth is estimated at $1.1 billion, and members of her family. York took control of the team in 2000 from her brother, Edward DeBartolo Jr., after he pleaded guilty to concealing an extortion plot by a former governor of Louisiana. Brother and sister inherited their money from their father, Edward DeBartolo Sr., a shopping-mall developer who became one of the nation’s richest men before his death in 1994. A generation ago, the DeBartolos made their money the old-fashioned way, by hard work in the free market. Today, the family’s wealth rests on political influence and California tax subsidies. Nearly all NFL franchises are family-owned, converting public subsidies and tax favors into high living for a modern-day feudal elite. Pro-football coaches talk about accountability and self-reliance, yet pro-football owners routinely binge on giveaways and handouts. A year after Hurricane Katrina hit New Orleans, the Saints resumed hosting NFL games: justifiably, a national feel-good story. The finances were another matter. Taxpayers have, in stages, provided about $1 billion to build and later renovate what is now known as the Mercedes-Benz Superdome. (All monetary figures in this article have been converted to 2013 dollars.) The Saints’ owner, Tom Benson, whose net worth Forbes estimates at $1.2 billion, keeps nearly all revenue from ticket sales, concessions, parking, and broadcast rights. Taxpayers even footed the bill for the addition of leather stadium seats with cup holders to cradle the drinks they are charged for at concession stands. And corporate welfare for the Saints doesn’t stop at stadium construction and renovation costs. Though Louisiana Governor Bobby Jindal claims to be an anti-spending conservative, each year the state of Louisiana forcibly extracts up to $6 million from its residents’ pockets and gives the cash to Benson as an “inducement payment”—the actual term used—to keep Benson from developing a wandering eye. In NFL city after NFL city, this pattern is repeated. CenturyLink Field, where the Seattle Seahawks play, opened in 2002, with Washington State taxpayers providing $390 million of the $560 million construction cost. The Seahawks, owned by Paul Allen, one of the richest people in the world, pay the state about $1 million annually in rent in return for most of the revenue from ticket sales, concessions, parking, and broadcasting (all told, perhaps $200 million a year). Average people are taxed to fund Allen’s private-jet lifestyle. The Pittsburgh Steelers, winners of six Super Bowls, the most of any franchise, play at Heinz Field, a glorious stadium that opens to a view of the serenely flowing Ohio and Allegheny Rivers. Pennsylvania taxpayers contributed about $260 million to help build Heinz Field—and to retire debt from the Steelers’ previous stadium. Most game-day revenues (including television fees) go to the Rooney family, the majority owner of the team. The team’s owners also kept the $75 million that Heinz paid to name the facility. Judith Grant Long, a Harvard University professor of urban planning, calculates that league-wide, 70 percent of the capital cost of NFL stadiums has been provided by taxpayers, not NFL owners. Many cities, counties, and states also pay the stadiums’ ongoing costs, by providing power, sewer services, other infrastructure, and stadium improvements. When ongoing costs are added, Long’s research finds, the Buffalo Bills, Cincinnati Bengals, Cleveland Browns, Houston Texans, Indianapolis Colts, Jacksonville Jaguars, Kansas City Chiefs, New Orleans Saints, San Diego Chargers, St. Louis Rams, Tampa Bay Buccaneers, and Tennessee Titans have turned a profit on stadium subsidies alone—receiving more money from the public than they needed to build their facilities. Long’s estimates show that just three NFL franchises—the New England Patriots, New York Giants, and New York Jets—have paid three-quarters or more of their stadium capital costs. Many NFL teams have also cut sweetheart deals to avoid taxes. The futuristic new field where the Dallas Cowboys play, with its 80,000 seats, go-go dancers on upper decks, and built-in nightclubs, has been appraised at nearly $1 billion. At the basic property-tax rate of Arlington, Texas, where the stadium is located, Cowboys owner Jerry Jones would owe at least $6 million a year in property taxes. Instead he receives no property-tax bill, so Tarrant County taxes the property of average people more than it otherwise would. In his office at 345 Park Avenue in Manhattan, NFL Commissioner Roger Goodell must smile when Texas exempts the Cowboys’ stadium from taxes, or the governor of Minnesota bows low to kiss the feet of the NFL. The National Football League is about two things: producing high-quality sports entertainment, which it does very well, and exploiting taxpayers, which it also does very well. Goodell should know—his pay, about $30 million in 2011, flows from an organization that does not pay corporate taxes. That’s right—extremely profitable and one of the most subsidized organizations in American history, the NFL also enjoys tax-exempt status. On paper, it is the Nonprofit Football League. This situation came into being in the 1960s, when Congress granted antitrust waivers to what were then the National Football League and the American Football League, allowing them to merge, conduct a common draft, and jointly auction television rights. The merger was good for the sport, stabilizing pro football while ensuring quality of competition. But Congress gave away the store to the NFL while getting almost nothing for the public in return. The 1961 Sports Broadcasting Act was the first piece of gift-wrapped legislation, granting the leagues legal permission to conduct television-broadcast negotiations in a way that otherwise would have been price collusion. Then, in 1966, Congress enacted Public Law 89‑800, which broadened the limited antitrust exemptions of the 1961 law. Essentially, the 1966 statute said that if the two pro-football leagues of that era merged—they would complete such a merger four years later, forming the current NFL—the new entity could act as a monopoly regarding television rights. Apple or ExxonMobil can only dream of legal permission to function as a monopoly: the 1966 law was effectively a license for NFL owners to print money. Yet this sweetheart deal was offered to the NFL in exchange only for its promise not to schedule games on Friday nights or Saturdays in autumn, when many high schools and colleges play football. Public Law 89-800 had no name—unlike, say, the catchy USA Patriot Act or the Patient Protection and Affordable Care Act. Congress presumably wanted the bill to be low-profile, given that its effect was to increase NFL owners’ wealth at the expense of average people. The insertion of professional football leagues into the definition of not-for-profit organizations was a transparent sellout of public interest. This decision has saved the NFL uncounted millions in tax obligations, which means that ordinary people must pay higher taxes, public spending must decline, or the national debt must increase to make up for the shortfall. Nonprofit status applies to the NFL’s headquarters, which administers the league and its all-important television contracts. Individual teams are for-profit and presumably pay income taxes—though because all except the Green Bay Packers are privately held and do not disclose their finances, it’s impossible to be sure. For Veterans Day last year, the NFL announced that it would donate cash to military groups for each point scored in designated games. During NFL telecasts that weekend, the league was praised for its grand generosity. The total donation came to about $440,000. Annualized, NFL stadium subsidies and tax favors add up to perhaps $1 billion. So the NFL took $1 billion from the public, then sought praise for giving back $440,000—less than a tenth of 1 percent. In the NFL, cynicism about public money starts at the top. State laws and IRS rules generally forbid the use of nonprofit status as a subterfuge for personal enrichment. Yet according to the league’s annual Form 990, in 2011, the most recent year for which numbers are available, the NFL paid a total of almost $60 million to its leading five executives. Roger Goodell’s windfall has been justified on the grounds that the free market rewards executives whose organizations perform well, and there is no doubt that the NFL performs well as to both product quality—the games are consistently terrific—and the bottom line. But almost nothing about the league’s operations involves the free market. Taxpayers fund most stadium costs; the league itself is tax-exempt; television images made in those publicly funded stadiums are privatized, with all gains kept by the owners; and then the entire organization is walled off behind a moat of antitrust exemptions. 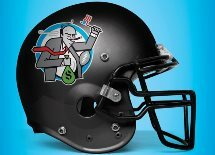 The reason NFL executives’ pay is known is that in 2008, the IRS moved to strengthen the requirement that 501(c)6 organizations disclose payments to top officers. The NFL asked Congress to grant pro football a waiver from the disclosure rule. During the lobbying battle, Joe Browne, then the league’s vice president for public affairs, told The New York Times, “I finally get to the point where I’m making 150 grand, and they want to put my name and address on the [disclosure] form so the lawyer next door who makes a million dollars a year can laugh at me.” Browne added that $150,000 does not buy in the New York area what it would in “Dubuque, Iowa.” The waiver was denied. Left no option, the NFL revealed that at the time, Browne made about $2 million annually. Perhaps it is spitting into the wind to ask those who run the National Football League to show a sense of decency regarding the lucrative public trust they hold. Goodell’s taking some $30 million from an enterprise made more profitable because it hides behind its tax-exempt status does not seem materially different from, say, the Fannie Mae CEO’s taking a gigantic bonus while taxpayers were bailing out his company. Perhaps it is spitting into the wind to expect a son to be half what his father was. Charles Goodell, a member of the House of Representatives for New York from 1959 to 1968 and then a senator until 1971, was renowned as a man of conscience—among the first members of Congress to oppose the Vietnam War, one of the first Republicans to fight for environmental protection. My initial experience with politics was knocking on doors for Charles Goodell; a brown-and-white Senator Goodell campaign button sits in my mementos case. Were Charles Goodell around today, what would he think of his son’s cupidity? Roger Goodell has become the sort of person his father once opposed—an insider who profits from his position while average people pay. I wanted to put questions about the NFL’s finances to Roger Goodell. When I was researching my book The King of Sports, from which this excerpt is drawn, I requested interview time with Goodell, and he agreed. When NFL headquarters learned that my questions would cover tax exemptions and health issues in the league, the interview was promptly canceled. League spokesman Greg Aiello told me it was not in the NFL’s “best interests” to discuss safety or subsidies. One might suppose that with football raking in such phenomenal sums of cash, politicians could win votes by assuming populist stances regarding NFL subsidies and exemptions. Instead, in almost every instance, Congress and state legislatures have rolled over and played dead for pro football. NFL owners pressure local politicians with veiled threats of moving teams, though no franchise has moved since 1998. Public officials who back football-stadium spending, meanwhile, can make lavish (if unrealistic) promises of jobs and tourism, knowing the invoices won’t come due until after they have left office. Too often, NFL owners can, in fact, get away with anything. In financial terms, the most important way they do so is by creating game images in publicly funded stadiums, broadcasting the images over public airwaves, and then keeping all the money they receive as a result. Football fans know the warning intoned during each NFL contest: that use of the game’s images “without the NFL’s consent” is prohibited. Under copyright law, entertainment created in publicly funded stadiums is private property. When, for example, Fox broadcasts a Tampa Bay Buccaneers game from Raymond James Stadium, built entirely at the public’s expense, it has purchased the right to do so from the NFL. In a typical arrangement, taxpayers provide most or all of the funds to build an NFL stadium. The team pays the local stadium authority a modest rent, retaining the exclusive right to license images on game days. The team then sells the right to air the games. Finally, the NFL asserts a copyright over what is broadcast. No federal or state law prevents images generated in facilities built at public expense from being privatized in this manner. Baseball, basketball, ice hockey, and other sports also benefit from this same process. But the fact that others take advantage of the public too is no justification. The NFL’s sweetheart deal is by far the most valuable: This year, CBS, DirecTV, ESPN, Fox, NBC, and Verizon will pay the NFL about $4 billion for the rights to broadcast its games. Next year, that figure will rise to more than $6 billion. Because football is so popular, its broadcast fees would be high no matter how the financial details were structured. The fact that game images created in places built and operated at public expense can be privatized by the NFL inflates the amounts kept by NFL owners, executives, coaches, and players, while driving up the cable fees paid by people who may not even care to watch the games. In too many areas of contemporary life, public subsidies are converted to private profit. Sometimes, such as with the bailout of General Motors, once the subsidies end, society is better off; sometimes, as with the bailout of AIG, subsidies are repaid. Public handouts for modern professional football never end and are never repaid. In return, the NFL creates nothing of social value—while setting bad examples, despite its protests to the contrary, regarding concussions, painkiller misuse, weight gain, and cheating, among other issues. The No. 1 sport in a nation with a childhood-obesity epidemic celebrates weight gain; that’s bad enough. Worse, the sport setting the bad example is subsidized up one side and down the other. The NFL’s nonprofit status should be revoked. And lawmakers—ideally in Congress, to level the national playing field, as it were—should require that television images created in publicly funded sports facilities cannot be privatized. The devil would be in the details of any such action. But Congress regulates health care, airspace, and other far-more-complex aspects of contemporary life; it can crack the whip on the NFL. If football images created in places funded by taxpayers became public domain, the league would respond by paying the true cost of future stadiums—while negotiating to repay construction subsidies already received. To do otherwise would mean the loss of billions in television-rights fees. Pro football would remain just as exciting and popular, but would no longer take advantage of average people. In 2010, the National Football League moved its annual Pro Bowl away from Honolulu for the first time in 30 years. At the very time Hawaii was cutting its budget for public schools, state lawmakers voted to pay the NFL $4 million per game to bring the event back to their capital. The lawmakers’ gift-giving was bad enough. What was disgraceful was that the rich, subsidized owners of the NFL accepted. Until public attitudes change, those at the top of the pro-football pyramid will keep getting away with whatever they can. This is troubling not just because ordinary people are taxed so a small number of NFL owners and officers can live as modern feudal lords and ladies. It is troubling because athletics are supposed to set an example—and the example being set by the NFL is one of selfishness. Football is the king of sports. Should the favorite sport of the greatest nation really be one whose economic structure is based on inequality and greed?